Sunflower Seed Pesto - Vegans Eat What? Vegans Eat What? I got this recipe while attending the “Vegan Schmegan” class at The Almost Vegan Cooking School in February, 2013. My favorite way to use this pesto is to spread it on sprouted bread and top it with some sliced tomato, a few salad greens and fresh pepper - Delish! Add all the ingredients EXCEPT the olive oil to a food processor and pulse several times. Slowly add the olive oil and pulse until well blended. Taste and add additional lemon juice and salt as desired. * Spoon the pesto over any cooked pasta (I use whole wheat spaghetti). Thin the pesto as desired with a little pasta cooking water and additional extra virgin olive oil. 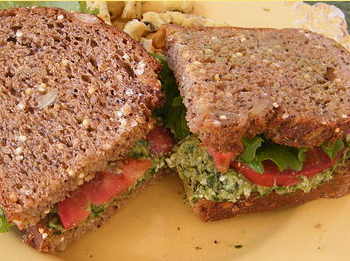 * Spread the pesto on good quality bread (I like Sprouted Seed Seduction Bread from Whole Foods). Top with sliced tomato, a few salad greens and fresh pepper. * Add to your favorite soup.